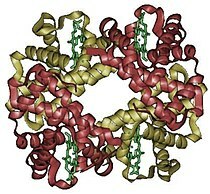 ^ Hemoglobin. Dictionary.com Unabridged. Random House. Campbell, MK. Biochemistry third. Harcourt. 1999. ISBN 0-03-024426-9. Eshaghian, S; Horwich, TB; Fonarow, GC. An unexpected inverse relationship between HbA1c levels and mortality in patients with diabetes and advanced systolic heart failure. Am Heart J. 2006, 151 (1): 91.e1–91.e6. PMID 16368297. doi:10.1016/j.ahj.2005.10.008. Ganong, WF. Review of Medical Physiology 21st. Lange. 2003. ISBN 0-07-140236-5. Hager, T. Force of Nature: The Life of Linus Pauling. Simon and Schuster. 1995. ISBN 0-684-80909-5. Kneipp J, Balakrishnan G, Chen R, Shen TJ, Sahu SC, Ho NT, Giovannelli JL, Simplaceanu V, Ho C, Spiro T. Dynamics of allostery in hemoglobin: roles of the penultimate tyrosine H bonds. J Mol Biol. 2005, 356 (2): 335–53. PMID 16368110. doi:10.1016/j.jmb.2005.11.006.